Are you wondering how to raise an early reader? There are ways that you as the parent of your child can use to encourage early reading. You don’t have to wait till your child is a toddler or preschooler. You can start right from the beginning when your child is still a baby to help him develop pre-reading skills. Since my son was an infant, I’ve used various ways to interest him in books and reading. He is now less than three months away from turning three, but he will take out books on his own, sit quietly in a corner, and flip through the pages of the books. He shows an obvious interest in books and right now, he is learning to read very simple stories. I’ll share with you five easy things you can do to help your child grow an interest in books and reading. Yup, even though you might feel that your infant doesn’t understand a word you are saying, pick up some children board books and start reading to your baby. This will increase your bonding time with your baby, and let baby know that there is something interesting to be found in books. Don’t wait till your child is older, you can start right now and make books a part of her life. An easy way to do this is to make books a common sight in the house. Even though you might find it boring, read the same book with the same enthusiasm as if you are reading it for the first time. Let baby know that reading is a fun activity. It has been said that children learn to remember stories before they could read them. I believe it has something to do with repetition. I have also experienced this with my own son. For some books, I have read it to him many times. When he started to speak a little as a toddler, I was surprised when he could remember the ending words to the story I was reading to him! Fascinating. Try to make letters and words a constant sight in your daily life. Buy sets of magnetic, foam or wooden block letters, and let your child have fun playing with them. She might not recognize letter names when she started. In time to come, with constant exposure to the alphabet, she will learn to recognize them. Likewise, display baby books out where your baby can easily reach for a book. Let her play with her books. More likely she will chew on them. Let her. When she is older, she will learn to turn the pages. Then she will start looking at the pictures. And later, she will be looking at the words. Let books be in her sight constantly. Not everyone knows that the proper way to read text is from left to right. Not babies, toddlers, and preschoolers. Reading is a new skill to them. So reinforce to your child that we read from left to read. One of the best ways to do so is to point under the word you are reading, and move your finger along as you read from left to right. In time to come, your child will naturally read from left to right. 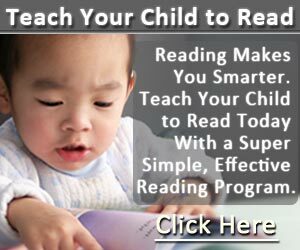 If you want to give your toddler or preschooler a head start, look out for a great reading program that will teach you how to teach your child to read in simple and effective steps. Check out tips on choosing a good reading program. That is what I have done and I have started teaching my son how to read when he was 2 years 3 months old. We’re not done yet with our chosen reading program, but I’ve seen how his reading ability took flight and it has been a very rewarding experience. I didn’t use to think I could be my son’s teacher. But now I am his first teacher and you too can become your child’s first teacher. Remember to always keep it fun, light and informal for your child when helping him develop pre-reading or reading skill. Toddlers learn best through play, so make your pre-reading activities fun and find a good reading program that makes it fun to learn reading! ← Toddler Learning ABC the Fun Way!